HID Global will showcase its veriCLASS and identiCLASS embedded reader platforms, finalists in the CARTES 2010 SESAME awards, at next week’s CARTES & Identification 2010 Exhibition and Conference. In addition to highlighting its line of FARGO direct-to-card printers, HID Global will also present “TIP: Basic Building Blocks for Constructing and Using Trusted Identities” at a conference session and HID will jointly host an exhibitor workshop, entitled “Interoperability Across Various Payment Schemes,” with Wincor/Nixdorf on the show floor. HID’s identiCLASS and veriCLASS embedded reader platforms for e-government, cashless payment and ticketing are based on universally adaptable contactless reader technology and have full FCC and CE modular approvals. The solutions have a range of developer support tools and a developer services offering. Cashless Payment and Ticketing Systems – veriCLASS offers a single reader solution that is capable of simultaneously supporting closed-loop payment schemes such as automatic fare collection and open-loop debit/credit card schemes on the same reader platform. On display will be the veriCLASS 3300 reader core for space-constrained applications; and the 3500 reader board for terminal applications, providing integration with an embedded antenna and onboard SAM socket. e-Government – identiCLASS e-ID embedded reader platform is a single embedded device solution that includes a reader core and reader board to meet the demands of OEM partners and manufacturers of e-ID authentication systems for design-in, turnkey e-ID solutions. On display will be the identiCLASS 3300 reader core for hand-held terminals and other space critical applications; and the 3500 reader board for kiosk terminals where multiple antennas are required. HID’s Developers Center Showcase – HID Global’s online Developer Center, Embedded Device Manager and Developer Tool Kit provide developers with the necessary support resources to speed time to market for e-government, cashless payment and ticketing solutions. 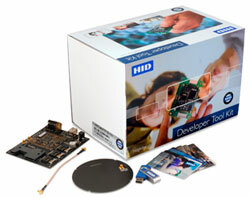 The tool kit includes documentation, developer boards/reader core, drivers, sample code and testing materials. Printing and Encoding Solutions – HID will showcase its line of FARGO printer/encoders, including high definition HDP5000 and HDPii printers; and the new DTC1000, DTC4000 and DTC4500 direct-to-card printer/encoders. The new line of FARGO direct-to-card printers includes optional field-upgradeable modules to scale to future printing requirements and higher levels of smart card security. HID Global will feature its suite of technologies, products, solutions and services in Hall 3, Stand F002 at the Paris Nord Villepinte Exhibition Center from Dec. 7-9.